Please find below a list of key publications that cover key areas in the field of Distribution & Franchise Law. 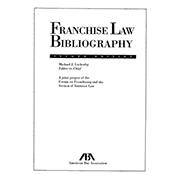 This book provides annotates of various treatises, symposia, and law review articles pertaining to franchising from 1966 to 1982. Topics discussed include labor, tax, torts and antitrust law. 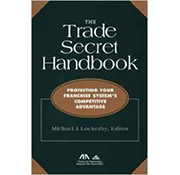 It is this commercial reality that makes The Trade Secret Handbook one of the most valuable resources on the shelf of any franchise or distribution company today, as well as an essential tool for the lawyers who advise them. This guide looks at issues that effect both the franchisor and the franchisee. This new edition updates the third edition (published in 2003), consolidates the supplement materials since that edition, and incorporates case law, statutory, and administrative developments since the book was last supplemented. 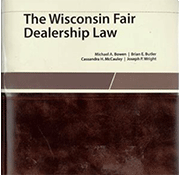 Such developments and discussions include, but are not limited to the feasibility of constitutional challenges to the Wisconsin Fair Dealership Law (WFDL) on equal protection, due process, and free speech grounds. A continuing development and refinement of the Ziegler “community of interest” principles of the WFDL, and differing approaches taken by Wisconsin state and federal courts. Get both the business and legal perspective on key distribution issues – Written for business and legal professionals by the distribution and franchising law experts of Foley & Lardner, the Guide provides a view of this increasingly complex area of business that balances regulatory principles and business building strategies to provide useful, real world guidance. 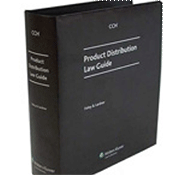 Apply the practical expertise of over 20 distribution experts – With more than 20 distribution and franchising experts providing over 100 years of practical experience, the Guide provides a practical, solutions-oriented approach to the myriad of legal issues involved in product distribution. 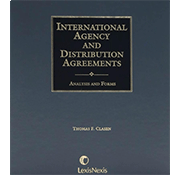 This comprehensive treatise provides U.S. and foreign practitioners with the essential information needed to prepare and review foreign sales agency and distribution agreements. In one well-organized source, the author provides legal analysis and legislative background to guide a client through the agreement process accurately, efficiently, and authoritatively. The four volumes of the treatise are organized intuitively. This continuously updated list of digital Legal Newsletters and Legal News Alerts provides insight on real-world antitrust, tax, contract, labor and employment, litigation, IP, and licensing legal issues as they come up to help you manage your relationships to your advantage. If you’re interested in receiving these emails, please click here to subscribe.